Indian Prime Minister Narendra Modi faced the first stirrings of trouble in his Bharatiya Janata Party (BJP), as party veterans blamed the top leadership for the electoral loss in eastern Bihar state and demanded a review of party affairs. Analysts see the emerging dissent as aimed primarily at ousting the party's president, who is a key Modi aide. The BJP lost the state election in Bihar, India's third most populous state, on Sunday to a political alliance led by Bihar Chief Minister Nitish Kumar. The loss - the second major setback for the BJP after the Delhi state election early this year - triggered rumblings against party leaders, especially BJP president Amit Shah, who crafted the election strategy in Bihar and whose presidency is up for review in two months. Mr Shah is the politician who implements Mr Modi's agenda within the party. 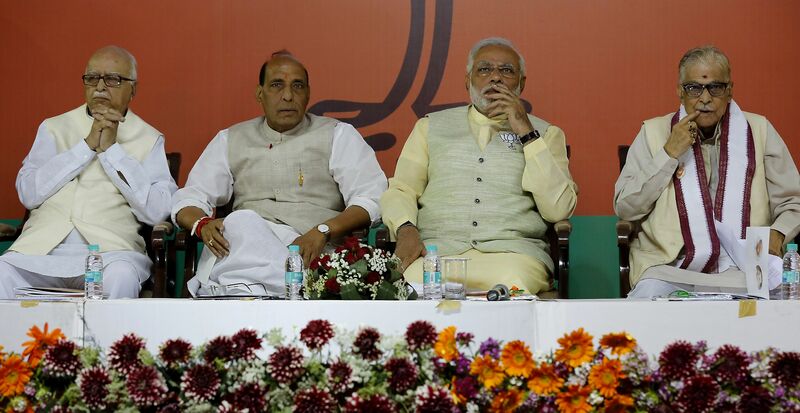 "The principal reason for the latest defeat is the way the party has been emasculated in the past year," said a joint statement by four party veterans, who have been sidelined under the Modi regime, and are led by former deputy prime minister L.K. Advani. A review was needed as "the party is being forced to kow-tow to a handful", they added. Mr Modi came to power last year on a wave of popularity that handed a majority to the BJP. A powerful orator, he was the key face of the BJP campaign in Bihar. However, the BJP won only 58 of the 243 seats up for grabs, while Mr Kumar's alliance won 178. Though analysts do not think the loss has diminished Mr Modi's clout in the party or grip on the government, they say it shows that all is not well in the BJP. "This is the first real challenge to his (Modi's) leadership. They (party veterans) have the moral authority and are backed by a large section of the party who are not getting anything in this present regime. They are sidelined, but it doesn't mean they are powerless," said Mr Nilanjan Mukhopadhyay, author of a biography on Mr Modi. "This (protest) is also aimed at mounting pressure to make sure Amit Shah doesn't get a new three- year term (as party president)." It is not expected to be easy for rebels to dislodge Mr Shah, who enjoys Mr Modi's complete trust. Yet the dissent burst into the open when BJP leader and former Bollywood actor Shatrughan Sinha and MPs from Bihar accused the central leadership of mismanaging the election and sidelining local leaders. "At the moment, it is not a challenge to Modi's leadership but it can turn into one because it is the expression of many voices. The main target is Amit Shah," said Mr Sudhir Panwar, a political analyst and member of the Uttar Pradesh Planning Commission. For Mr Modi, the next clutch of state elections in Assam, West Bengal and Tamil Nadu will be critical. The BJP needs to win them in order to boost its strength in the upper house of Parliament, where it is in a minority and unable to push through key Bills, like that for a goods and services tax. Some believe the Bihar results also showed up the limitation of the BJP's Hindu agenda. It has been accused of polarising voters along religious lines to boost Hindu support. "The Bihar debacle shows polarising (Hindu and Muslim) voters did not pay dividends," said Prof Bidyut Chakrabarty, a political science professor at the University of Delhi. "The BJP needs to rethink its (Hindu) strategy, but I doubt they will undertake a course correction."